Actions by regulators in the waning months of 2015 should serve as notice to community banks that ignoring forward looking analytics will lead to lower CAMELS scores, more examiner scrutiny and higher regulatory capital requirements. The new current expected credit loss model (CECL), which is expected early this year, is also a forward-looking tool. Amid signs that community banks are again accumulating higher concentrations of risky commercial real estate loans, regulators are reminding banks that stress testing is indeed required to manage concentration risk in their portfolios and to develop realistic scenarios for interest rate risk management. (See “Regulators to Banks: CRE Lending May Lead to More Required Capital,” p. 1). The large banks have already adopted forward-looking risk analytics and are using the results with regulators. 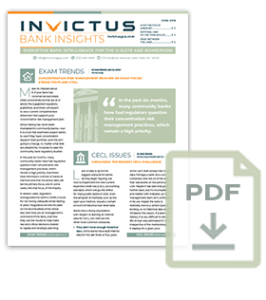 Although community banks are not subjected to the same stress testing requirements as the large banks, the regulatory trend is in the same direction. Those community banks that fail to incorporate new analytics into their risk management systems will find it increasingly difficult to communicate effectively with regulators, who are using forward-looking risk analytics themselves.